As soon as I came across this recipe on Pinterest I knew I would make it. 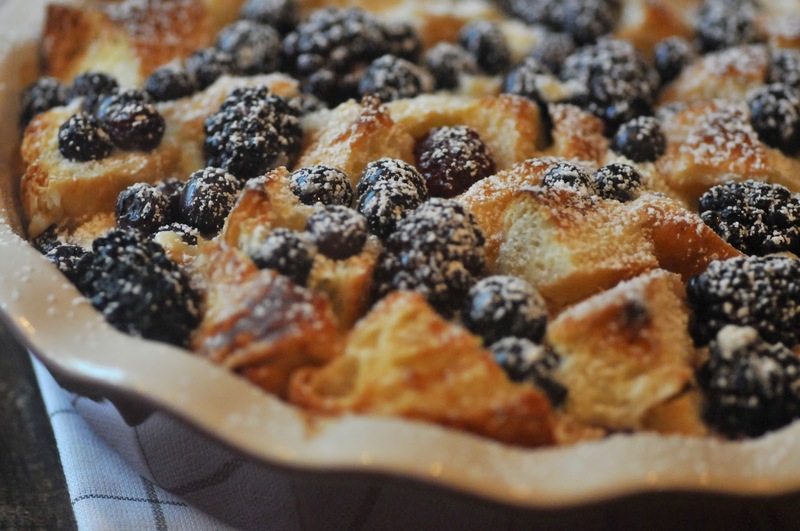 I love breakfasts and desserts that include warm berries, add in croissants and cream cheese PLUS the benefit of making it ahead of time, and you have a winner in my book! This will be my new go to recipe when I volunteer to bring the main dish for teacher breakfasts or events. In fact, the first time I made it, I doubled the recipe and put in in a 9 x 13 baking dish to take for coaches and volunteers at the morning session of this summer's swim team championships. The dish was a HUGE hit. I've made a couple modifications to the original recipe because I can't help but add lemon when berries and cream cheese are in a recipe. This dish is great served warm, but also holds up well at room temperature after sitting out for a while. Place croissant pieces in a buttered 9 inch square pan or pie dish. Sprinkle with berries. Beat cream cheese and sugar until well blended. Add eggs, one at a time, and mix until fully incorporated, then add lemon zest and vanilla. Gradually add milk. Pour mixture evenly over croissants and berries. Cover with plastic wrap and refrigerate over night. Remove dish from fridge and let stand at room temperature for 25 minutes. Bake 35-40 minutes until center is set and dish is golden brown. Cover with foil for the last 10 minutes if top is getting too brown. So you broke the croissant pieces up, right? Looks delicious! yes! sorry, that wasn't too clear. I amended the ingredients above so it makes sense. thanks! enjoy! This sounds delicious. Perhaps a first day of school breakfast treat? Yes! This looks delicious. I like to add lemon zest to berry desserts too. Wow! You are something! I can't wait to make this for my family!!! Beyond that I wish for the time! Love your posts. We made it this weekend and it was wonderful! 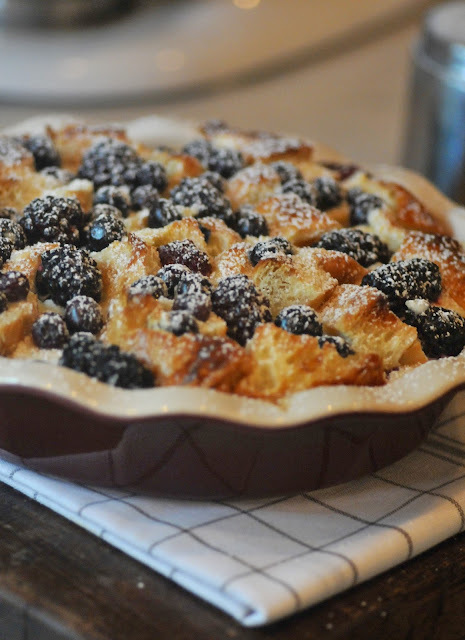 Thanks for the recipe, we're already planning to make it next weekend too! I made this while we were vacationing at the lake. It was a big hit! Thank you for sharing. I made this while my in laws were visiting recently and everyone went back for seconds. I love something that can be prepped the night before so I'm not trying to pull everything together while the littles are running (or crawling) around in the morning. I used the frozen berry mix I had on hand and picked up croissants from our fantastic, local French bakery in walking distance from our home. This is a keeper. Thank you!